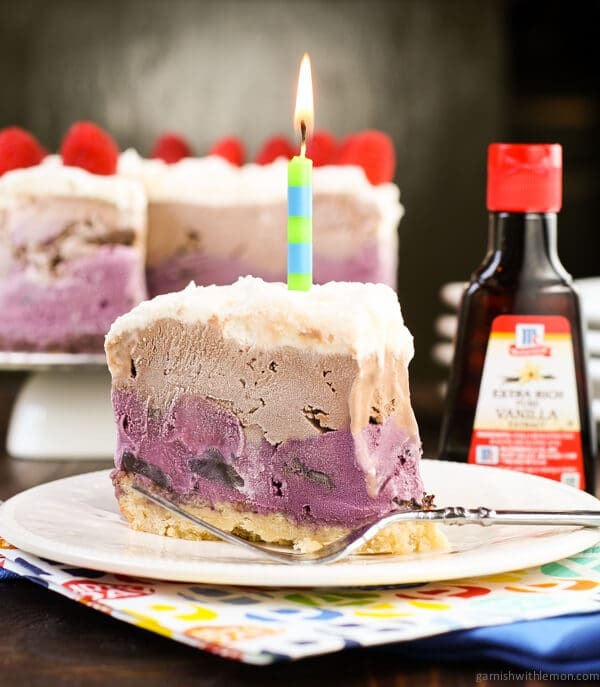 Birthday celebrations don’t get much sweeter than this Raspberry Chocolate Chip Ice Cream Cake! My little guy turns 9 on September 28th. Not sure how that happened, but it certainly calls for a celebration. Birthdays are a big deal in our house. We have several traditions in our family which get a little more meaningful every year, especially when one of them is that you don’t have to do dishes on your birthday. Now that the kids have more responsibility around the house, these treats take on a whole new meaning. The birthday boy also gets to pick his birthday dinner and dessert. I’ve talked before about how Charlie tends to go the nontraditional route on his birthday desserts. It used to always be this tart, but this year he requested a Raspberry Chocolate Chip Ice Cream Cake, and I was more than happy to oblige. Did you know that September is the most popular month for birthdays? We have a handful of birthdays in our family in September. A cool thing about Charlie’s birthday is that he shares it with his great Uncle Frank who is exactly 84 years older. Sweetest man ever. When McCormick® asked us if we could share our birthday flavor story, and I found out McCormick® has the SAME birthday as Charlie, I knew it was destiny. Especially when they sent us some Extra Rich Pure Vanilla to sample because Charlie is my vanilla boy. If having both chocolate and vanilla isn’t an option, he will always pick vanilla. And he requested a sugar cookie crust on his Raspberry Chocolate Chip Ice Cream Cake. What better way to jazz up the sugar cookie crust than with extra rich pure vanilla? It’s the perfect balance of caramel and bourbon under notes and is 25% stronger than regular vanilla, perfect for our fellow vanilla lovers out there. The rest of the cake is layered with raspberry chocolate chip ice cream, chocolate ice cream with a vanilla whipped cream frosting. Pure heavenly deliciousness and exactly what this nine-year-old wanted to make his birthday wishes come true. How do you celebrate birthdays? Share your birthday flavor story with us below and you will be entered to win a McCormick® gift pack worth $50. And since it includes an exclusive edition of McCormick® vanilla extract, you can make your own sugar cookie crust ice cream cake. See entry details below. So ready, set, go! Share your favorite birthday flavor story using #flavorstory! Place butter and sugar in the bowl of a stand mixer and beat until light and fluffy. Add egg and mix well. Add dry ingredients and stir until just combined. Spread cookie dough in the bottom of a 9-inch springform pan. Bake for 15-18 minutes or until lightly golden brown. Cool completely. Spread raspberry chocolate chip ice cream over sugar cookie layer and make a smooth top. Spread chocolate ice cream on top of raspberry chocolate chip ice cream and make a smooth top. Cream butter, 3 tablespoons whipping cream and vanilla until smooth. Add powdered sugar. Mix until combined. In a separate bow, whip remaining whipping cream to stiff peaks. Fold whipped cream into frosting. Remove the springform sides and frost cake. Serve immediately or freeze until ready to serve. Allow cake to sit for a few minutes before cutting into slices. Disclosure: This post was sponsored by McCormick®. All opinions are my own. Thanks for supporting the companies that allow us to develop unique content for you. This cake is so pretty! Happy Birthday to your son! Pinning! If it weren’t already 50 degrees here…. I’d make this now! Booking marking for next summer! Wow, this cake is gorgeous and looks just delicious! Well done. Happy birthday to your lil guy! I want to come live with you as you make some pretty stellar treats for birthdays! And I love sugar cookie crusts for my ice cream cakes too. Doesn’t get much better than that! Charlie has great taste! What a delicious looking cake. Happy birthday to him and Uncle Frank, too! Consider it done. Thanks, Beccca! A big HAPPY BIRTHDAY to your little man! What a lovely way to celebrate. I didn’t know September is the month with the most birthdays! I wish my birthday was in September if it meant I got to eat this amazing cake!! My boys always request ice cream cake for a birthday, love this version! Your son is so smart. What a delicious sounding cake and your photo is beautiful! I love the flavor combination of raspberries and chocolate together – but have never tried it with ice cream! What a great idea for a cake! It’s so good you will wonder what took you so long! Enjoy! I love your little man’s taste! This cake looks to die for! Hope he has the best birthday! It’s my birthday today! Just kidding, it’s not. But I want someone to make this for me! DELISH. Come and eat some cake with us! Happy birthday to your little guy! My older two are about to turn 8 and 10 🙂 I love this cake so much, it’s so pretty!! Almost, indeed. It is delicious! These flavors sound perfect together! And it’s so beautiful too! What a beauty, I just LOVE ice cream cakes and this one is extra pretty!! Such a beautiful cake and story! I’m going to bawl when my little Judah turns 9! It’s sooo hard to watch them grow up and it happens too quickly! Happy Birthday to your son! Mine is 9 too, fun age! Love this cake, he made a great choice. It is in the 80’s here, so ice cream cake is perfect right now! totally wish i had a slice of this ice cream cake in front of me right now to deovur.. it looks so delicious! What a fun birthday cake! Love the flavors! What a fun and creative recipe! Had it for dinner and it was awesome! Thank you! I couldn’t help but notice this post… my birthday is the 29th and although I won’t be baking my own cake now I must have ice cream cake! Thx for sharing and hope your little guy has an awesome birthday!! This cake is SO incredible! We do birthdays the same way around here. It’s a big deal!!! So much fun. For my birthday I pick THIS cake!!! What a perfect birthday cake, Lisa! Beautiful job! Happy birthday to your little man! 🙂 This cake is a fabulous way to celebrate! I can only imagine how delicious it was. Pinned! I have always wanted to have an ice cream cake for my birthday – this looks so wonderful! They are a favorite in our house and so easy too! Black raspberry ice cream was one of my favorites growing up! I haven’t had it in so long! 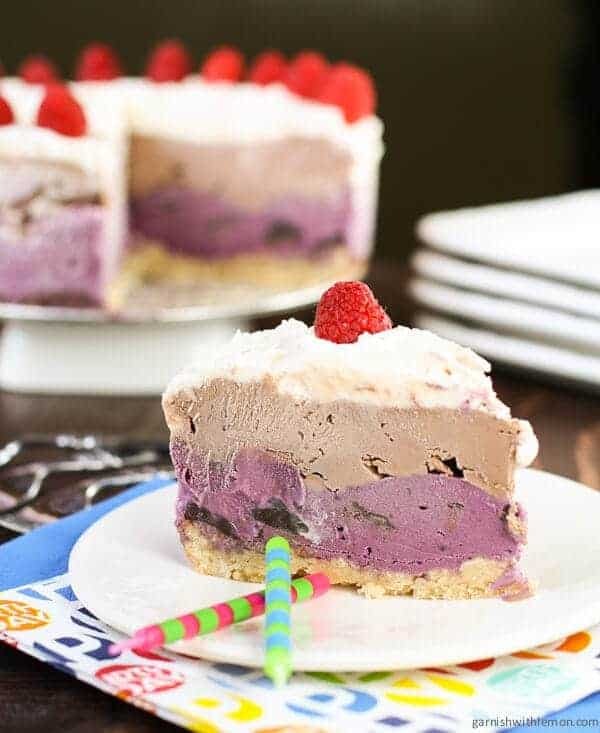 We always used to make ice cream cakes instead of regular birthday cakes, so this is right up my alley! They are the best, aren’t they? And you can’t go wrong with black raspberry and chocolate chips!